Life has been flying by. I honestly cannot believe how long it’s been since I’ve posted, but I decided to be nice to myself and not fret about it too much. There’s only so much energy that I have each day and I’m trying not to push it. I’m pretty much drained in the evening, even with taking a nap. That whole “second trimester energy burst”? Yeah, I’m calling bull crap on that, especially now that I’m beginning my third trimester. I have to take a nap every day so that I can keep my eyes open until 9:00 PM (but yes, everything is fine, I checked with my midwife). It doesn’t leave a lot of time for sewing! I did finally start on a project for the baby. I’ve been focused on using my sewing time to make garments for my own dwindling wardrobe, but I wanted to start something tiny! I originally didn’t think I’d knit anything but hats for our little one, but a friend convinced me that I should knit at least one sweater. Hopefully the 3 month size I chose will get some wear out of it before the baby grows too much! I don’t think I got to tell you yet. We’re having a GIRL! I was very excited when we found out, because LITTLE TINY DRESSES! BLOOMERS! SWEATERS! EEEEKK! My mind is swimming with things I want to make. It’s taking everything I have not to search on Etsy for vintage baby girl dress patterns. I knew that the sweater pattern I chose would need to be really easy, so I picked the Annabel Babe Cardigan. 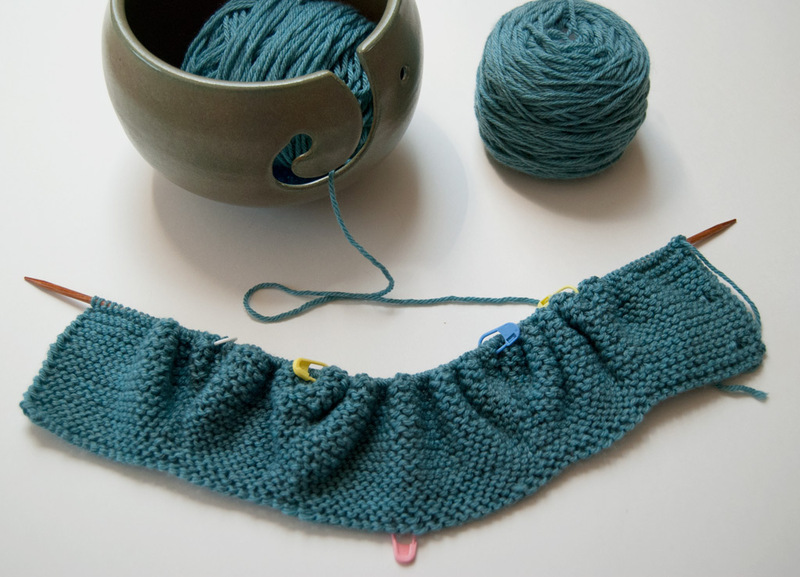 It’s all garter stitch, with simple increases. Hey, I’ve only screwed it up twice! Thank goodness it was easy to fix. This made for a perfect airplane knitting project for a recent trip to Indiana that we took. I picked up the yarn at Close Knit. It’s Cascade Yarns 220 Superwash Sport in color number 1910. I love stitching with merino wool. It works so smoothly on the needles and always blocks nicely. The color is a really lovely greenish-blue, and while picking it out I instantly thought of all of the vintage buttons I have that would go well with the color. I’m going to change the pattern a bit so that I only use 3 buttons. Mostly because I know I’ll never button her up all the way in a wool sweater, but also so that I can save a few buttons to put on a matching dress. Am I getting a little crazy yet? It’s going to be amazing. As far as sewing for myself, I’ve adjusted and created patterns, washed and cut out my pieces, but only sewn up one maxi skirt. Tomorrow is a sewing day, so I should have much more to share soon! There are currently 2 shirts and a dress sitting on my table, begging to be stitched. Before I was pregnant, I was mostly a jeans girl. 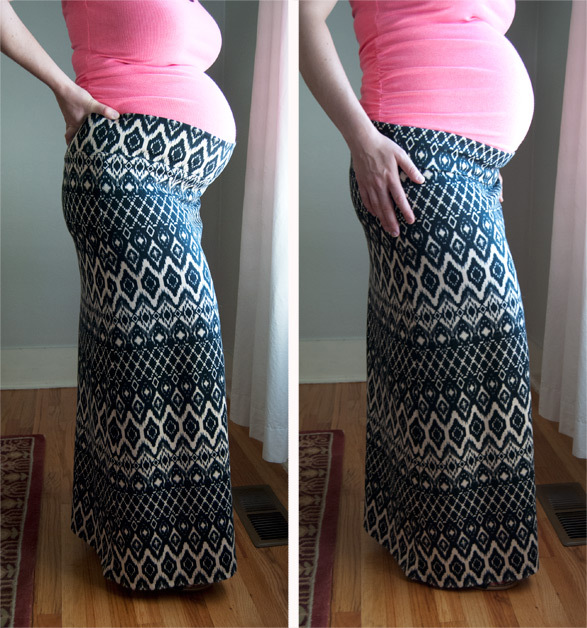 Let’s just say this about maternity jeans though- they are horrible and should all be burned. Do you like it when your pants fall down every other step and you end up penguin-walking because your crotch is practically between your knees? Me neither. I tried on several pairs by different brands but none of them were very comfortable. A friend had given me a fold-over waistband skirt, which I quickly copied. It feels so much better than pants! I got this particular fabric from Girl Charlee. I had to return my first fabric order from them because the knits I chose were too thin. On my second try I went for the Ponte de Roma knit though, and hit the jackpot. I chose this black and white print so that I could wear it many times over with different colors of solid shirts. I baaaaarely ordered enough yardage to match up the pattern on the side seams, but there was no way I could let that go, even if it meant making the skirt a bit more straight than I originally intended. I have worn this skirt both with the waistband up (and a shirt over it) and with it rolled down (and my shirt tucked in). I prefer it rolled down. It may be kind of nice as it gets cooler to have my belly covered up a bit more and to leave it unrolled. Either way, I’m going to keep making these, because they’ll be great to wear post-partum too. So, I have two questions for you. Which buttons would you choose for the cardigan? Also, would you be interested in a tutorial for whipping up a quick one of these skirts for yourself? I promise they look great on non-pregnant ladies too! This entry was posted in Knitting, Life, Projects and tagged babies, knitting, sewing on July 30, 2014 by Amy Alan. I like the pearl buttons and I’d love a skirt tutorial! Congratulations, you look fantastic! Pearl buttons- your vote is noted. 🙂 And thank you! I’ll get up a skirt tutorial as soon as I can. :O LOVE the glass heart buttons!!! can you tell me where you picked those up???? I love them too! They have been favorites in my stash for a long time. I got them at Knittin’ Kitten, my favorite little sewing/knitting thrift shop in Portland. They have a great stash of vintage glass buttons, which I can never resist. Awwww… The hearts are the best, so cute! They are my favorite too, even with the paint half-missing! I would suggest easy to use buttons… talking from experiencie here!! Ha! Good point! I think that rules out the horses. Oh the hearts are beautiful but being a horse-woman, I love those little ponies. Not as practical, I’m sure but the sweater will be a keepsake for ever and those buttons are adorable. You are so beautiful and I love seeing the update photos. As a mum of a first-born daughter I’m super excited you will have a lovely baby girl in your family. I love the little horse buttons! I am debating saving them and turning them into some sort of framed art piece. I would hate for one to get broken or go missing from a tiny garment! Thanks so much! I am really excited to be having a little girl too. I’ll be glad when some patterns I ordered get here so I can start sewing tiny clothes! YAY a girl!!!!! How fun! I love all the buttons- how could you ever choose??? Yes- yay! I’m excited to make teeny tiny dresses. I love all of the buttons, but I think my favorites are the glass hearts. I’ve waited so long to use them! I was really liking the prancing ponies until I saw the hearts, and I was like, “Oh, yes, definitely yes (on the heart buttons)”. I could have sworn you were gonna have a boy, but so happy it is a girl for you. I would love a tutorial on the skirt. I did not originally like them when I first saw them in stores, but I have grown to like them. I will putting a tutorial together on the skirt very soon. Right now it’s so hot in my attic studio that I can’t stay up there for long! Okay! I will post it as soon as I can get up into my attic studio to work on it. Right now the summer sun is making it impossibly hot up there, but I want to get to it not only to post the tutorial, but to add another skirt to my wardrobe! I think your daughter will find it to be very comfortable. I vote for the glass hearts – so sweet! And you did a great job with your skirt. You look wonderful. I am all for the glass heart buttons too cute. Would live yo see a skirt tutorial. It seems most everyone loves those glass heart buttons as much as I do! I will have a skirt tutorial posted as soon as it cools down a bit in my attic studio. It’s hard to sew when it’s 88 degrees up there (that’s with the AC on)! Estás preciosa, siempre la maternidad embellece a la mujer y hace brotar su más sublime virtud…la generosidad con Dios. Gracias, Marcela! Es usted muy amable. Oh Amy, you’re the best, and I like the glass heart buttons too! We’re like a bunch of aunts out here, excited for you!! Me too! I have waited so long to use those heart buttons on a tiny garment. I’m so happy to finally get to use them! I say make three sweaters! They are all perfect! I am quite tempted to do so! It is a really easy and relaxing pattern knit. If I like the way this one turns out, I may just keep going and make more! I love the idea of the pony buttons on a soft green-colored sweater. I like the pony buttons, but I maybe not so practical 🙂 The yarn you’re using is such a lovely colour! Btw- I was so excited to sew the baby nest this weekend, and what do you know, I went to the fabric store and forgot to get yardage for it. Ugh! Now I’ll have to go back (oops)! Yeah, it made sense 🙂 My yarn stash is growing, I keep stocking up when my favourite company has discounts. Naw, I hate when I forget the yardage I need, I usually overbuy then 😉 Can’t wait to see your babynest! I love the horse buttons, BUT you love them, so save them for a little later…a 3 month old’s clothing gets washed a LOT, haha. My youngest is 27, so my memory is becoming patchy (about all things it seems, darn aging process), but I think most knit/ crocheted items back in my day had knit/crocheted tie closures, I believe for safety (button can’t end up in mouth, no pressure points, etc)…something to think about maybe. Yeah, I think I will save the horse buttons for a bit longer. 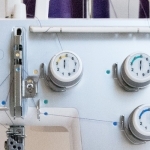 I think they require slightly bigger buttonholes too, and might be better as “false” buttons, with actual snaps used behind them to hold the garment closed. I didn’t think about the whole “baby eating buttons” thing. I don’t see this as something that I leave her in alone though. More of using it almost as a light sweater that gets taken off when we’re indoors. You can be sure I’ll be tying on these buttons extra tight!